Very similar to how our church started, I began writing in 2010 after God used a man named Tom Carpenter to inspire me. Tom was the custodian at Grace Fellowship for many years. In January 2010 he was diagnosed with terminal cancer and died a short three weeks later on February 16, 2010 at the age of 51. This was a very moving experience for me, my family, and our church. Tom was always behind the scenes, always seemed to be at the church serving in some way, and was so familiar that he almost went unnoticed…until he wasn’t able to be there. Tom was single all his life and faithful in his service to the Lord. He was loved by all. Our family visited Tom several times before He died and we would sing him Fighter Verse songs to encourage him, but I think he encouraged us more by how he handled his final days. The families in our church rallied around Tom. 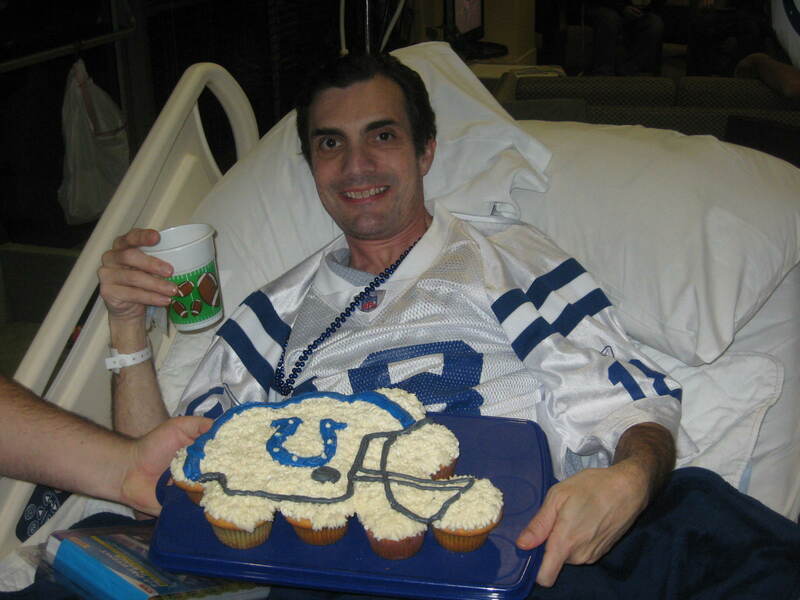 We even threw him a Super Bowl party while he was in the hospital that was quite the logistical challenge of moving TVs, moving Tom and his bed in the lobby, and getting “approval” from the staff and security guards. Before Tom died he wrote three CaringBridge posts that so moved me that I felt compelled to write myself and you may find them all here. The first song I wrote was titled “Tom’s Song” and after many iterations I’ve posted the latest version here. “I am also thankful for the time God has blessed me with. Time, however, is something I have often squandered in my life. There have been so many instances where I have not used time wisely. For the most part, I took time, a precious gift of God and used it selfishly to my own frivolous ends and purposes. God forgive me. None of us know how much time God will give us. What I have often failed to realize is that it is not my time at all. Time, like everything in this life, belongs to God. Of course, God is mindful of the time we must dedicate to our families and our livelihoods. God does not begrudge us time to take pleasure in this life He gives us. I’ve since spent many hours with God, digging in His Word, writing syllables of grace and shedding tears because of His overwhelming greatness. I pray that these syllables will long out live me, but if not, it’s been time well spent with God.